Getting ready to send out your wedding RSVP cards? Stressed about how to go about it? Planning a wedding is not easy. With everything there is to plan, the last thing any bride wants is for her RSVP list to go haywire. The guest list is the top priority when it comes to RSVPs. Despite all your efforts, you’ll still have 1 or 2 people who forget to RSVP. You’re going to be plenty busy organizing the seating chart in the final weeks leading up to the big day. You need to know who is coming, and so do your caterers and the venue. The last thing you want is for something to go awry. RSVP invitations should go out no less than 6 weeks before the wedding. Ideally, they should go out 8 weeks before the reception. Invitees should have received Save-the-Date memos even earlier. If you previously compiled a guest list when you mailed out your Save-the-Date memos, great! It shouldn’t be hard to compile your RSVP invitation list! You’re going to want to number your guest list (we’ll explain why later…). Make a copy of the list, and keep a checklist of the RSVP invitations you’ve already sent out. You also want to make note of people’s locations. Some guests on your list may live farther than most. You want to give them ample time to plan so they can make the trip in for your big day. Be consistent with how you notify people about your big day. 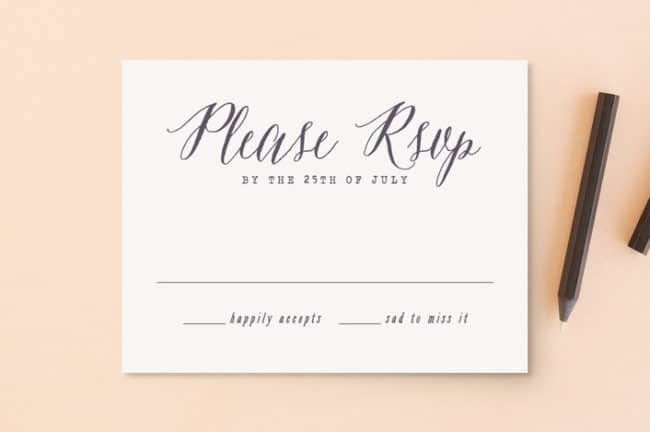 If you sent Save-the-Date memos in the mail, you should also mail out your RSVP invitations. 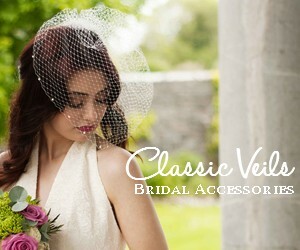 Brides traditionally mail RSVP invitations through the post office. But these days, more and more brides are opting to send RSVPs by email. 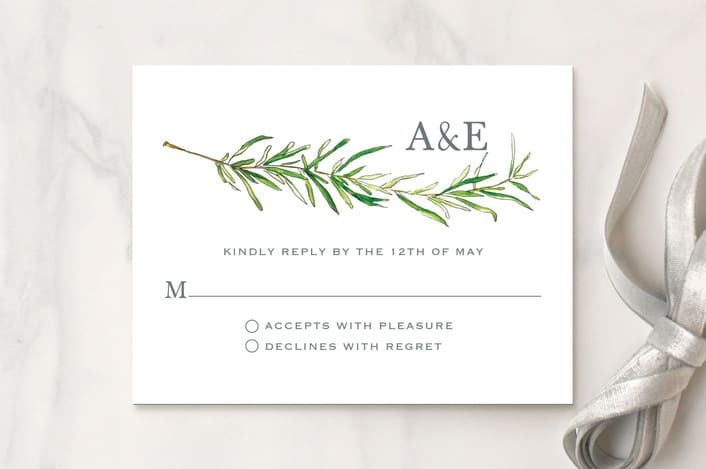 Regardless of how you send, if you’re having a wedding reception, your RSVPs should be concise. 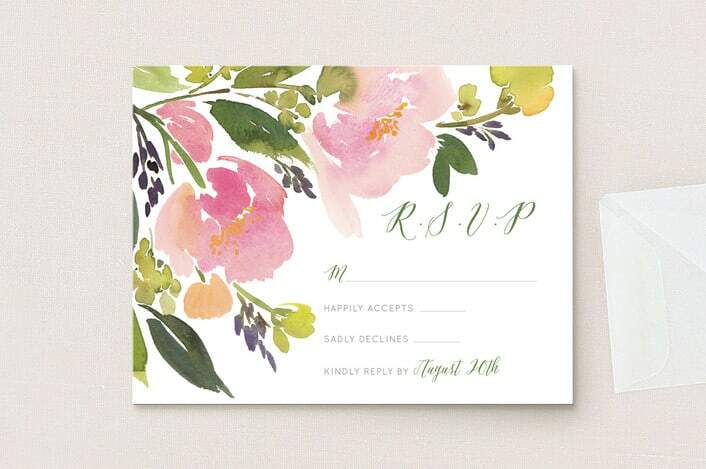 Before you make your wedding RSVP invitations, you need to establish and confirm a reply date. You need to confirm the RSVP reply date with your venue coordinators and caterers. They need a final headcount by a certain date so they can plan everything accordingly. Your florist and cake decorator may also need a final headcount. Florists need an idea of how your floor plan will be set up. Whoever is preparing your desserts needs to make sure there is plenty to go around. You also want to give yourself enough time with the RSVP reply date. You’ll need a headcount if you plan to provide your guests with party favors, for example. If planning a destination wedding, invitees should get an RSVP card at least 2-3 months in advance. One of the fun parts of sending out wedding RSVP invitations is designing them! If your wedding has a color scheme or theme, make sure to incorporate it on the RSVP cards. Doing so reminds people of your colors and design scheme. Color schemes and themes help people remember wedding dates! Summer is the busiest time for weddings. Your guests are likely to attend other weddings around the same time as your summer wedding. Wedding stationery kits can help you color coordinate your RSVP cards and envelopes. There are a plethora of wedding stationery sources online. 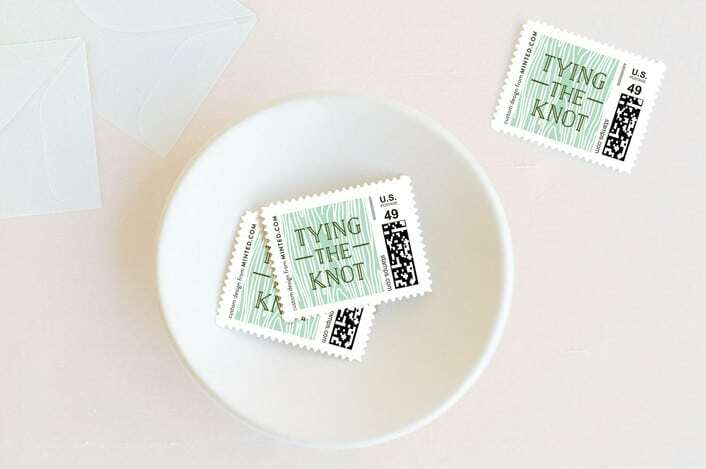 They can help you customize your Save-the-Date memos, RSVP cards, and corresponding envelopes! Believe it or not, people are more oblivious to the RSVP process than you’d think. Some people don’t even know what RSVP stands for! 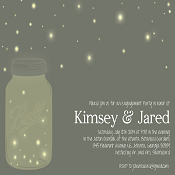 Emphasize the RSVP aspect of the invitation. So many brides overlook this small but significant detail. Make RSVP stand out in big letters. Bold it. Customize the font. Include a design around it. Or include the French phrase it’s derived from (with an English translation, of course)! Invitees need to know the date. The time and date of the ceremony should be the next thing that’s emphasized. There should be an option to accept and attend, or decline. Checkboxes are a classic choice for this. You may find it easier to include the choice of entrées with the RSVPs. It will prevent people from having to go to the mail twice, and it will help you stay organized. Include all necessary details about dress code, parking, and directions. 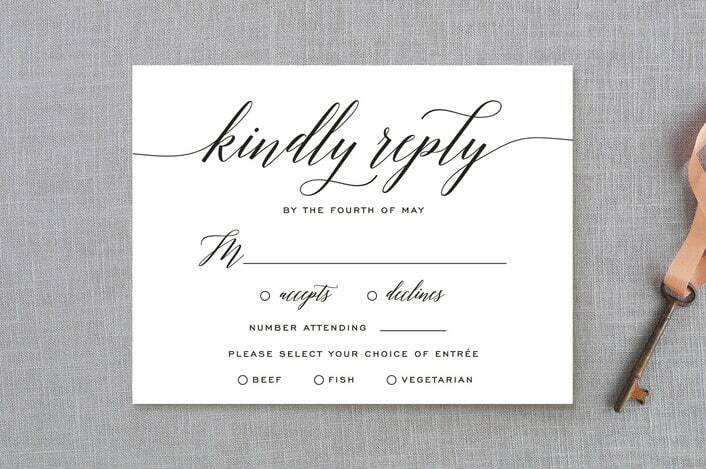 It doesn’t hurt to include your phone number and email address on the RSVP, as well. Wedding guests are traditionally addressed as their titles of “Mr.”, “Mrs.”, or “Ms.”. Nowadays, people are less formal. They address their wedding invitees on first and last name basis. How you address your invitees on the RSVP invitation and envelope is entirely up to you. If you decide to go the more formal route, you can leave a blank space with the letter “M” at the beginning. 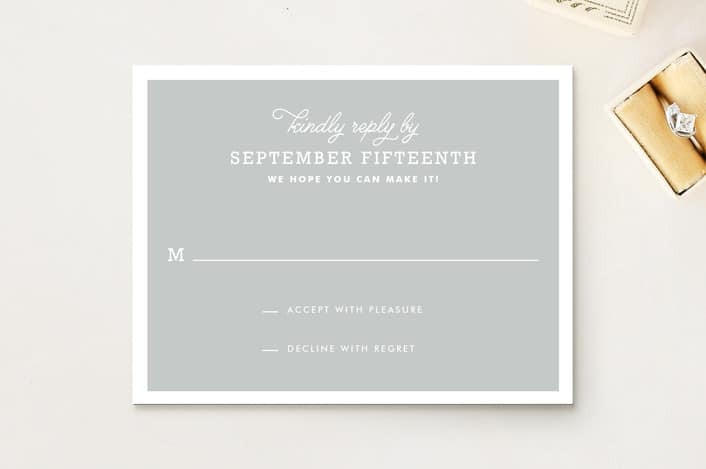 This allows your invitees to fill out the line as they see fit. It’s common for people to assume that they’re allowed to bring a guest to a wedding. To avoid confusion or awkwardness, explicitly detail this in the RSVP. Include a separate line for families to write down the number of people in their party. Want to make a lasting and classy impression on your invitees? Pre-stamp their RSVP return envelopes! By pre-stamping the return envelopes, you make it easier on your invitees! It’s easier to drop a pre-stamped envelope in a mailbox than it is to go digging for stamps. 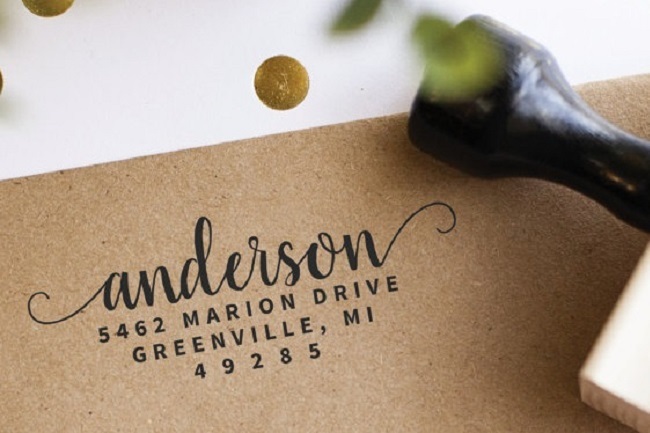 Pre-stamping your RSVP envelopes keeps one less hassle of your invitees’ plates. 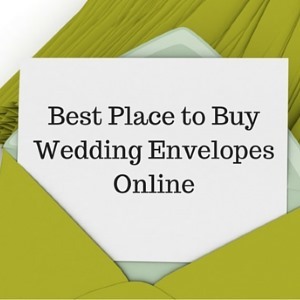 You can even save them an extra step by writing in or printing your address on the envelope. Every bride is bound to have a blank or illegible RSVP show up in their mail. Before this sends you into a tizzy, try this trick to keep your RSVP invitations in order. Every invitee should have a designated number. If you subtly write this number somewhere on the RSVP, the number can keep you from getting confused. Sometimes people forget to fill out important details. So, if you track your RSVP invitations with a number system, you can easily locate who it belongs to. Not only do invitees fail to fill out wedding RSVP invitations correctly. Sometimes they fail to fill them out and send them, period! Give your invitees a grace period after the RSVP reply date. It should usually be about 7 days after the requested reply dates. If anyone on your guest list fails to contact you after the grace period, you can give them a call or send them an email. Be gracious. Tell them that you need to let your venue or caterers know, or that you’re trying to prepare your guest list. Don’t come across as annoyed or frustrated. At the end of the day, people can be forgetful, things get lost in the mail, or they send things out past their due dates. If you respond graciously to an RSVP that’s M.I.A, your invitee will appreciate you reaching out to them! Wedding RSVP etiquette is straightforward for the most part. Whoever is planning your seating chart should receive the RSVPs. Whether that’s you, your maid of honor, your mom, or your wedding planner. Make sure this address is pre-written on the return envelope. If you decide to pre-stamp your RSVP return envelopes, try to use the same stamp as your Save-the-Date. It’s a minor detail, but the little things help to jog people’s memories. Don’t include your wedding registry information on the RSVP. Mention your wedding registry on your bridal shower invitations instead. Leave space on the RSVP so people can write you. This allows them to let you know of food allergies or special accommodations. Your friends and family can also write you notes that can help you get excited about your big day! Disaster can strike at any moment while planning a wedding. But, you can avoid it while coordinating your RSVP list! Knowing RSVP etiquette can help you create the best RSVP invitations. You can also avoid hassles and problems along the way. Learn more about how to plan your special day – and much more!